Are you interested in getting into an alkaline state? The fact is that it is much easier to achieve this when you learn more about the alkaline foods that can help you. It is good to know that you can consume these foods without any fears from the acidic impact and effects even though some of these foods are more alkaline compared to others. Keep in mind that you don’t have to consume alkaline foods exclusively if you want to balance the pH levels in the body and there are some foods that are acidic, but the best idea is to consume natural, raw foods like fruits for this purpose. 1. Almonds – If you take a close look at many lists of top healthiest foods, you will notice that almonds are found in most of these lists. They are one of the best alkaline foods. The vast majority of seeds and nuts are actually considered acidic but only when they are not sprouted. But, there are seeds and nuts that are neutral or just a little bit alkaline like almonds. 2. Amaranth – Amaranth is a grain that most people have never heard about, but this doesn’t change the fact that they are ideal for any alkaline-driven diet strategy. Amaranth is respected all over the world. FAO (Food and Agriculture Organization that is part of the UN), is recommending amaranth for more than 50 years because in areas where amaranth is part of the regular diet, there are no cases of malnutrition. This grain contains much more protein compared to wheat and also has more lysine amino acid. Experts point out that this grain is part of an outstanding group of photosynthetic compounds known as C4 group which means that it is very useful in turning water, light and soil into plant tissue. 3. Artichokes – Artichokes are usually used in salads or in dips, but these veggies are very useful especially if you want to improve alkaline environment in your body. A study conducted by the USDA has shown that artichokes are the vegetable that has the highest amount of antioxidants. They were among the top foods with highest amount of antioxidants among 1000 different types of foods. In case you didn’t know, antioxidants are crucial for our health because they eliminate free radicals that naturally occur in our bodies. If these free radicals are not flushed out of our system on time, they can cause many health issues and some of them can be quite serious (heart disease, cancer etc.). 4. Arugula – This is one of the best leafy green vegetable out there. Arugula is usually used in detoxification diet plans and the fact is that it is an excellent alkaline food too. This vegetable is packed with riboflavin, protein, thiamin, zinc, vitamin B6, vitamin B5 and copper. It can improve the levels of good cholesterol and lower the levels of bad cholesterol. In addition, the flavonoids it contains stabilize the blood pressure, prevent artery clogging, improve circulation and boost blood vessel work. 5. Asparagus – Asparagus provides strong alkaline effects and it is placed very high on the list of alkaline foods. Asparagus is among the foods with very high alkalinity, but this is not the only positive thing about this vegetable. For instance, asparagus is rich in nutrients, antioxidants and has strong detox properties. There are some studies that suggest that asparagus also has anti-aging properties. 6. Avocado and Avocado Oil – It is no wonder why avocado is present on this list. What is interesting is that many nutritionists claim that avocado is a superfood too. This exotic fruit is loaded with potassium and healthy fat which means that besides the positive effects on alkalinity, you will receive many nutrients too. It is also a good idea to use avocado oil because this is one of the rare oils that support alkalinity. 7. Basil – When we talk about providing alkaline effects or acidic effects, people usually don’t think about spices and herbs. However, it was proven that some spices like basil are great for those who want to keep their alkalinity. In addition, basil also comes with many other nutrients like flavonoids. Basil supports the healing and regeneration process in the body. 8. Beetroot – It seems that beetroot has reached record high popularity these days and one of the reasons for that is its ability to support our body’s effort to increase pH levels. Another good reason why people try to include beetroot in their everyday diet is the fact that this veggie is loaded with betalain, a phytonutrient that may provide anti-cancer effects. Beetroots can be used in salads or as a side. It is important to use fresh beetroots in order to get the most from them. 9. Broccoli – Broccolis have become a classic healthy food and the fact is that it is one of the best alkaline foods. When people learn about the positive effects of broccoli they usually start eating them daily. If you think that this is too much, it would be perfectly fine if you eat broccoli at least 3 times a week. Eating less won’t help you feel the positive impact to our health. How Does an Alkaline Diet Work? Individuals who want to boost their health and maintain their good health are perfect candidates for following alkaline diets. But, the majority of people are not familiar with the principles of this diet. The good news is that this diet is quite simple. Practitioners must focus on restoring balance and harmony that was gone when people decided to consume more processed foods. So, instead of eating foods rich in cholesterol, fat and sugar, alkaline diet practitioners consume more veggies, fruits, natural oils like flaxseed, olive and canola oil and other natural foods. 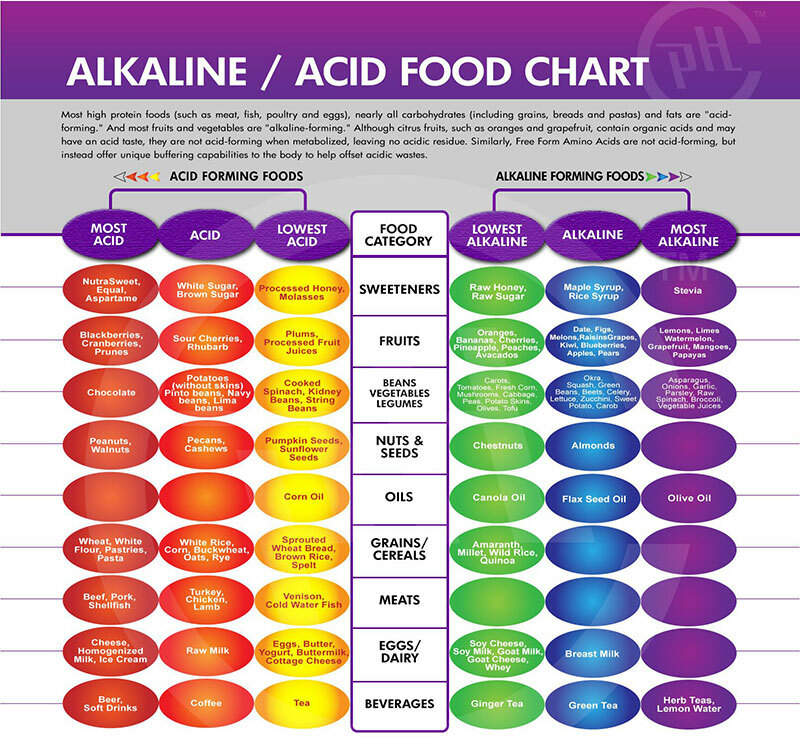 If you analyze these foods you will see that not all of them are alkaline – there are many acid foods too. However, when they are consumed together and processed in the body they will create alkalization effects. If the pH value in the body is a little bit more alkaline, then every bodily system will work in a better way. How does the pH Level Affect the Work of Our Body? The body’s pH level has impact on the work and state of every cell in the body. If the blood has alkaline pH and not acidic pH, we can witness a positive change in the work of the systems. The muscles, nerves, brain, digestive system, circulatory and respiratory system as well as the reproductive system will work better when the pH levels are normal. However, if the body’s pH is very acidic, we are more prone to illnesses and health issues. Early signs of aging, cardiovascular diseases, weight gain, allergies, chronic fatigue, muscle pain, nerve issues and even cancer are some of the health issues that are more common in people with imbalanced pH levels. Since there are higher chances for these issues to occur in a body with high acidic content, it is quite logical to follow a diet based on alkalizing products. The main objective is to take about 80% alkaline foods and 20% acidic foods. In case you manage to follow this ratio, you will get a little alkaline pH which means you will remain healthy. As we have already said, it is very simple to follow such diet. The vast majority of fresh veggies and fruits are perfect options. Even though red meat is not recommended, you must find good sources of protein for this diet. So instead of meat, use beans, soy products, nuts like almonds and legumes. Stay away from bad fats, but feel free to use foods with good fats like flaxseed, canola and olive oil. Dairy products with high fat content should be crossed off the list, but it is good to consume goat’s milk and soy milk. Cheese based on these milks is good too. Instead of drinking nutrient-free soft drinks, consume herb teas, lemon water and green tea. Stay away from coffee, but drink teas. Instead of eating pasta, you should eat whole grains like quinoa, millet and rice. If you want to make your meals sweeter, use only natural sweeteners like maple sugar, Stevia or raw sugar. It is quite obvious that there are many healthy options that are tasty and useful for this diet.